DNA evolved to store genetic information, but in principle this special, chain-like molecule can also be adapted to make new materials. Chemists at The Scripps Research Institute (TSRI) have now published an important demonstration of this repurposing of DNA to create new substances with possible medical applications. TSRI's Floyd Romesberg and Tingjian Chen, in a study published online in the chemistry journal Angewandte Chemie, showed that they could make several potentially valuable chemical modifications to DNA nucleotides and produce useful quantities of the modified DNA. The chemists demonstrated their new approach by making a DNA-based, water-absorbing hydrogel that ultimately may have multiple medical and scientific uses. "DNA has some unique properties as a material, and with this new ability to modify it and replicate it like normal DNA, we can really begin to explore some interesting potential applications," said Romesberg, a professor of chemistry at TSRI. Romesberg's laboratory over the past decade has helped pioneer methods for making modified DNA, with the ultimate goal of developing valuable new medicines, probes and materials- even artificial life forms. The team reached an important milestone last year with a feat reported in Nature Chemistry: the development of an artificial DNA polymerase enzyme that can make copies of modified DNA, much as normal DNA polymerases replicate normal DNA. The DNA modifications tested in that study involved only the attachment of fluorine (F) or methoxy (O–CH3) moieties to the sugar backbone of DNA nucleotides- modifications that in principle would improve the properties of DNA-based drugs. In the new study, Chen and Romesberg demonstrated several other modifications that their polymerase SFM4-3 can replicate and, in so doing, opened the door to the design of modified DNA for a much broader range of applications. One of the new modifications adds an azido group (N3), a convenient attachment point for many other molecules via a relatively easy set of techniques called "click chemistry," also pioneered at TSRI. The TSRI chemists showed that the SFM4-3 polymerase can replicate azido-modified nucleotides with adequate fidelity and can exponentially amplify strands of this modified DNA using a common laboratory method, polymerase chain reaction (PCR). Click chemistry can then be used to add any of a wide variety of different molecules to the DNA via the azido group. "With the azido-DNA and click chemistry, we were able to produce highly functionalized DNA, including DNA modified with an intense concentration of fluorescent beacon molecules and DNA marked with a chemical handle called biotin," said Chen, who is a postdoctoral research associate in the Romesberg Laboratory. The scientists in a more advanced demonstration used click chemistry to fasten multiple DNA strands to a central, azido-modified DNA strand, creating a "bottle brush" structure. They then used the assembly to amplify DNA via PCR to obtain a large mesh of DNA that-;to their surprise-;formed a hydrogel when exposed to water. "Hydrogels are a focus of great interest these days because they have a lot of potential applications, though there are relatively few ways for their controlled production," Romesberg said. The new DNA-based hydrogel turned out to have some intriguing properties. 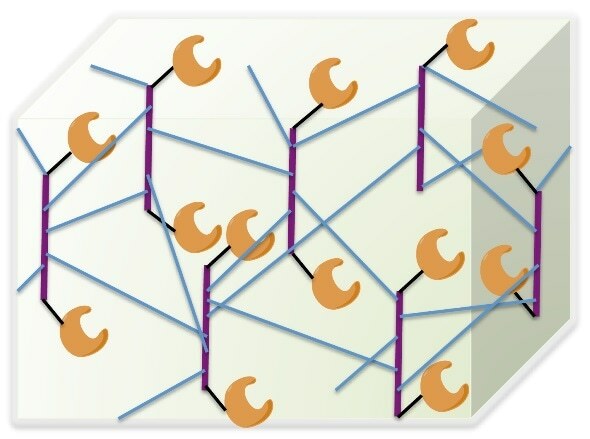 Chen and Romesberg found that they could dissolve it with DNA-cutting enzymes and later reform it in any desired mold using DNA-joining enzymes, allowing them to form and reform the hydrogel with new stable structures. Test proteins placed within the hydrogel also retained their biochemical activity. "We think this hydrogel can have applications ranging from novel forms of drug delivery to the growing of cells in three-dimensional cultures," Chen said. The researchers demonstrated that the SFM4-3 polymerase also can be used to replicate and amplify DNA that has been modified with three other types of additions to the backbone sugar: a chloro (Cl) or amino (NH2) group, or a hydroxyl group (OH) that combines with the backbone to form an arabinose sugar. Chen and Romesberg are now looking for additional DNA modifications that can be replicated using the SFM4-3 polymerase. At the same time, the researchers are pursuing specific applications of their modified DNA, including novel hydrogels. "Given that DNA can have different sequences that impart different properties, we can even start to think about evolving nanomaterials with desired activities," Romesberg said.